Accounting services of Tax accountant firm in Japan. Accounting services of Tax Accountants firm. People must request their works to a variety of professionals as there are a variety of professional fields. They request their tax to tax accountant, social insurance to social insurance and labor consultant as well as application of authorization for construction field to administrative scrivener services in Japan. 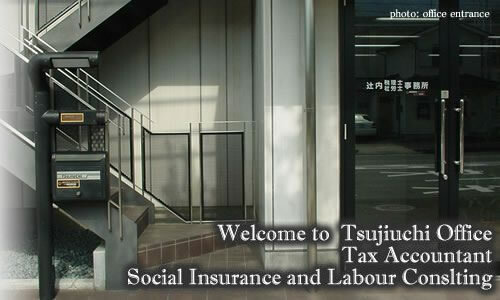 Each professional field such astax accountant,social insurance and labor consultant and administrative scrivener are related in a variety of aspects, and it is integrated and convenient by reducing time and expense if all of these works are handled at one accounting office (one stop service) in Japan. Our tax and accounting firm has qualified tax accountant,social insurance and labor consultant as well as administrative scrivener, and thereby we are able to provide the comprehensive service at low cost in Japan. Accounting services of Certified Tax Accountants firm. In our tax accountant firm, all the tax consulting is at free of charge, and as basic fee, we charge the minimum tax accountant fee (drawing up application form of corporate and income tax) in Japan. The fee other than the tax accountant fee is additional fee, and customers do not have to pay the fee of social insurance and labor consultant as well as administrative scrivener other than that by adopting the system where customers can select at their request (selection service). We provide the service at low tax accountant fee in Japan. Accounting services of Administrative scrivener firm. In our tax accountant and administrative scrivener firm, application form of construction industry such as application of authorization (screening of management, application of authorizing construction industry and analysis of management),registration of establishing a company as well as submitting documents to government are related to tax accountant’s services in Japan. In our tax accountant firm, we provide the comprehensive service at low tax accountant fee by integrated service (integrated service) as tax accounting and authorization are related as well as integrating tax and real estate appraisal with appropriate application in Japan. Accounting services of Social insurance and labor consultant firm. In our tax accountant as well associal insurance and labor consulting firm services in Japan, we have the contingency fee system where we do not charge to you before we win for request of subsidy and pension eligibility. If we lose, we do not request customers to pay.